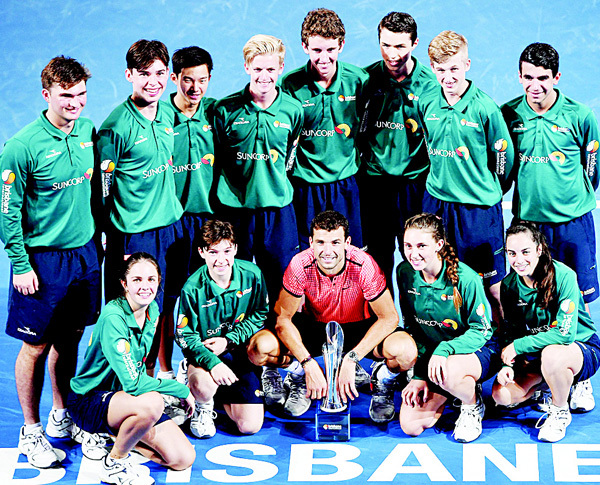 BRISBANE, Australia, Jan 8, (Agencies): Bulgaria’s Grigor Dimitrov won his first title in over two years when he upset world number five Kei Nishikori in three sets to win the Brisbane International on Sunday. 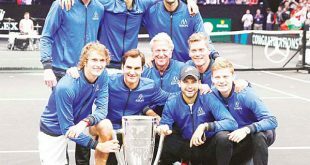 In an enthralling final between two evenly matched opponents, Dimitrov claimed the Roy Emerson Trophy 6-2, 2-6, 6-3, his fourth singles title on the ATP Tour. Dimitrov was ranked as high as eighth in the world in 2014 and was nicknamed “Baby Fed” because of his similar playing style to Swiss great Roger Federer. Injury problems and poor form saw him slump during 2015 and the first half of 2016, when he plummeted to 40th in the world. But he recovered towards the end of last year and entered the season-opening tournament ranked 17. The Brisbane win will see him climb to 15 when the rankings are released Monday. Dimitrov insisted he had not felt under pressure because of his rankings slide and said he knew he would eventually get the rewards for the hard work he was doing off court. The 25-year-old revealed later he had relaxed ahead of his matches with late-night visits to a Brisbane video game arcade. Despite Dimitrov’s win over top seed Milos Raonic in the semi-finals, the 27-year-old Nishikori had not lost to the Bulgarian in three previous meetings and went into the final as firm favourite. The Japanese star started well and had Dimitrov struggling to hold his opening service game. But from then on the Bulgarian dominated the first set, breaking Nishikori twice to take the opener in 36 minutes. Dimitrov took that momentum into the second set and was comfortable on serve. But at 2-2 he faltered and was broken, with Nishikori seizing the initiative and winning four games in succession to level the match. Nishikori took an injury break at the end of the second set to get treatment for a sore hip. This seemed to swing the momentum back to the Bulgarian, who immediately had the third seed under pressure. But Nishikori held on and both men were untroubled on serve, until at 3-4 the Japanese player stumbled and gave Dimitrov a vital break. 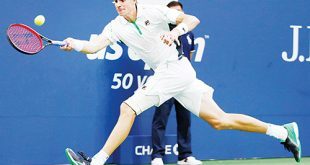 The Bulgarian stepped up and showed no nerves as he served out the match, claiming victory in one hour, 48 minutes when Nishikori sent a backhand long. Nishikori said he was not sure how bad his injury was but it would not affect his Australian Open chances. Second seed Roberto Bautista Agut of Spain humbled Daniil Medvedev with a straight-sets victory on Sunday to take his first Chennai Open title, kicking off the new ATP season in style. The world number 14 overcame the unseeded Russian 6-3, 6-4 in the one hour and 13-minute final in the southern Indian city of Chennai. Medvedev, 20, was broken in the fourth game of the first set as Bautista Agut set the pace with a 3-1 lead. The six foot, six inch Medvedev served big but Bautista Agut was clinical as he wrapped up the first set in just over 33 minutes. Medvedev made a spirited comeback in the second set to stay level at 4-4 but Bautista Agut broke through in the ninth game to edge ahead and clinch the match. The victory marked Bautista Agut’s fifth ATP title after he triumphed twice in 2014 and then again in 2015. 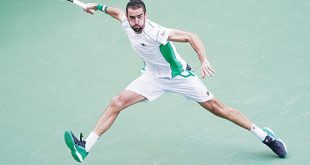 The Spaniard, who was playing in his second Chennai Open final after going down to Janko Tipsarevic in 2013, had beaten Frenchman Benoit Paire in the semis on Saturday to book his ticket to the final. Medvedev, who was appearing in the first ATP final of his professional career, praised his opponent following the loss. Svetlana Kuznetsova opened the defence of her Sydney International title with a comfortable 6-1, 6-4 victory over Irina-Camelia Begu on Sunday as the Australian Open warm-up event suffered a pair of big-name withdrawals. 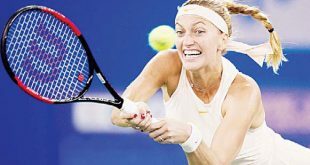 The Russian fifth seed started strongly by winning 10 of the first 11 games and after her Romanian opponent rallied in the second set to tie it up at 4-4, Kuznetsova broke again in the ninth game and served out the victory in 77 minutes. 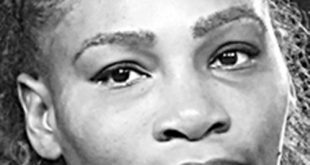 “I started the year quite good with the feeling,” the 31-year-old double grand slam winner told reporters. “Sometimes the results don’t go together with whatever you feel. But I feel very good for the start of the year, and for me it’s a very nice feeling. Kuznetsova will next face the winner of the match between local favourite Sam Stosur and fellow Russian Anastasia Pavlyuchenkova. Elsewhere, Canada’s Eugenie Bouchard, a former Wimbledon finalist, also won her opening match with a 7-6(1), 6-2 first round win over China’s Zhang Shuai. However, fourth seed Karolina Pliskova, who will climb to world number five following her Brisbane title win on Saturday, will not be able to aim for back-to-back victories after she pulled out of the event with a left inner thigh injury. The Czech was joined on the sidelines by Ukraine’s world number 14 Elina Svitolina, who withdrew citing a viral illness. “I’ve had constant headaches for the last two days and unfortunately in today’s hot weather it got even worse when I was warming up and my body wasn’t ready to compete,” Svitolina, who was seeded seventh, said. With the Australian Open tennis starting in a week’s time in Melbourne, Frenchwoman Alize Cornet also decided against risking a sore back and pulled out of the Hobart International, which she won last year. Cornet was the runner-up in Brisbane after going down 6-0, 6-3 to Pliskova in the final. “I am very sad I am not being able to play the tournament at Hobart this year,” she said in a video message on Twitter. “It was meaning a lot to me to come back here and defend my title but I have to be reasonable.